KnCMiner continues to get a more and more unhappy customers due to the continuing issues with the Titan Scrypt ASIC miners and the way the company seems to be treating their customers. Lately KNC has announced that they do plan to move from selling mining hardware to end users to making mining hardware for their own data center and to mine crypto currencies themselves. They have stopped accepting new orders from customers a while ago, their announced KNC Cloud mining plans were most likely just a PR move as the company most likely does not want to sell cloud mining hashrate to customers, though they apparently do still have the offer “available” for on their website. Back to the company’s Titan Scrypt ASIC miners, it seems that the shipping of units is still going very slow and we are already past the promised Q3 delivery for Batch 1 units. The people that were lucky enough to get their units already report a lot of issues and problems, both with the software and the hardware and apparently KNC is slow to respond to issues and it still refuses to offer refunds. Today KnCMiner has released a new firmware for the Titan miners that supposedly should improve stability and hashrate, and apparently it does help to increase hashrate. The latest update comes with the news that they “expect to deliver the remainder of batch 1 of the most efficient hardware miner on the market over the next three weeks to our customers”. Will this mean less unhappy customers, probably no, as there are people that are still expecting KNC to deliver on their promises made even before the drama with the Titan evens tarted. 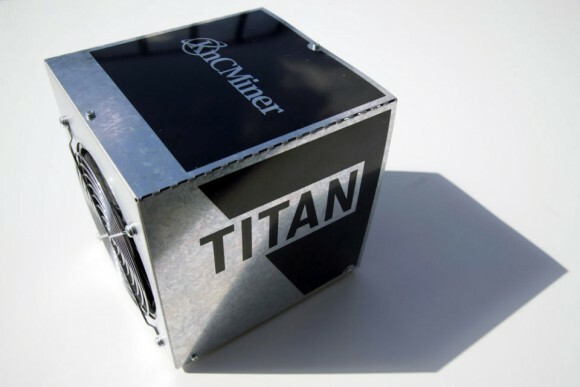 Earlier this month KnCMiner has announced that they are ready to start shipping the Titan Scrypt ASICs and they are apparently already doing so, though a bit late than they initially announced. Users on the Bitcointalk forum are reporting that they are seeing status updates on their pre-orders for the first batch of KNC Titan Scrypt ASIC miners that are apparently being shipped and they are getting tracking numbers. The pre-order price of the 300 MHS KnCMiner Titan Scrypt ASIC miner was $9995 USD without VAT and since their initial announcement they have been upgraded to 300 MHS hashrate (for the first batch) and to 400 MHS for the second batch. With the current price and the expected difficulty increase for Litecoin and other Scrypt-based crypto currencies the ROI time for these machines does not promise to be short. Not to mention that users that have received their units already are not too happy with the results – hardware issues and lower than advertised performance seem to be common, higher power draw than advertised is also reported and each cube still has a single PCI-E power connector for 250W+. Could KnC be following in the footsteps of BFL, decent start and then starting to disappoint customers more and more until the company gets shut down by the government?